With cooperation in space crumbling, what could Russia and Ukraine lose? Ukraine and Russia’s respective space agencies have been at odds ever since the events in Crimea and eastern Ukraine began in early 2014. But which projects have really taken a hit? Russia has been the biggest customer of Ukraine’s space industry since the collapse of the Soviet Union, but amidst recent events space cooperation between the two nations appears to be dissipating. 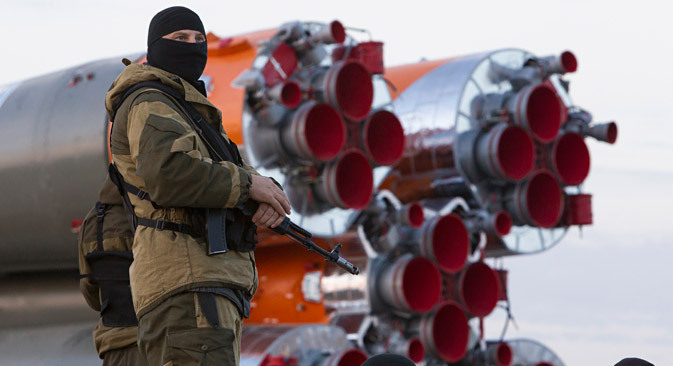 While Russia still buys Ukrainian equipment meant for non-military space exploration and International Space Station missions, the country did not order a single Ukrainian rocket or vessel throughout 2014. Unsurprisingly, many joint space projects are now at risk. Sea Launch, the world’s only commercial spacecraft launch service from a floating platform, operates Odyssey, a converted Japanese drilling rig used for the launches of payloads on Ukrainian Zenit-3SL rockets. The project was implemented jointly by Boeing, the Russian state company Energia, Ukraine’s state-owned enterprises Yuzhnoe Design Bureau and Yuzhmash rocket manufacturer and the Norwegian engineering firm Aker Solutions. Ukraine’s contribution involved building the first two stages of Zenit-3SL rockets while about 70 percent of the launch vehicles’ components were Russian-made. On June 22, 2009 Sea Launch declared bankruptcy, emerging in 2010 with Energia taking control of the reorganized entity. On December 24, 2014 Russia declared the collaboration with Ukraine on Sea Launch was no longer feasible due to the conflict in that country, announcing plans to replace Zenit-3SL with Russian-made Angara launch vehicles. Developed with the know-how gained from Sea Launch missions, the Land Launch service involves using Zenit-3SLB and Zenit-3SLBF rockets — modified versions of the Zenit-3SL, designed to be launched from land rather than sea — for delivering commercial payloads into orbit. The rockets are to lift off from the Baikonur Cosmodrome. All nine launches of modified Zenit vehicles, conducted as part of the project from 2008 to 2013 were successful. Cheaper and more environmentally friendly, the new rockets were supposed to replace Russian-made Proton-M vehicles. Still, Ukrainian officials maintain that the Sea Launch and Land Launch projects could be revived within the new Air Launch project, involving the launch of Zenit rockets from the Antonov An-225 Mriya, the largest and heaviest airplane ever built, which is the holder of an absolute record in terms of its carrying capacity. Rokot rockets, three-stage launch vehicles converted from retired ICBMs with a carrying capacity of almost 2,000 kilograms, are produced by Russia’s Khrunichev State Research and Production Space Center. The rockets come equipped with Ukrainian-made control systems produced by the Khartron design bureau. The main buyer of Rokot family vehicles was the Russian Ministry of Defense. Their main advantage was their relatively low cost, amounting to $20 million, including manufacturing and launch. But as the Ukrainian government has banned all military sales to Russia, including some dual-use rocket technologies supplied by Ukrainian companies, it appears that the Russian military will have to find other rockets. After Crimea joined Russia following a controversial referendum in March 2014, Ukraine lost access to its mission control center, the National Space Resources Management and Testing Center, located in the village of Vitino near Yevpatoria. The Center housed control systems for Sich family Earth observation satellites and also for its not-yet-launched telecommunications satellite Lybid. Ukraine did not get its equipment back from the Center, which has since been integrated into Russian Aerospace Defense Forces and has become a part of the Titov Main Test and Space Systems Control Center. The Ukrainian government transferred control of the Lybid satellite to the Kiev-based Ukrkosmos firm, which has been tasked with creating a new control center. Until then, the country’s space agency plans to control the satellite using a leased command center located in Italy. The rest of Ukraine’s satellite constellation will eventually be controlled by yet another facility, which is currently being built in the Khmelnytsky Region in Western Ukraine. First published in Russian in Lenta.ru.